Anantapur, Jan 30: Andhra Pradesh Chief Minister Nara Chandra Babu Naidu on Tuesday officially launched the launched the trial production of internationally acclaimed Kia Motors in Anantapur district of Andhra Pradesh. On this occasion, Naidu along with Kia officials took a test drive of the KIA car and expressed satisfaction over the fast-paced development. 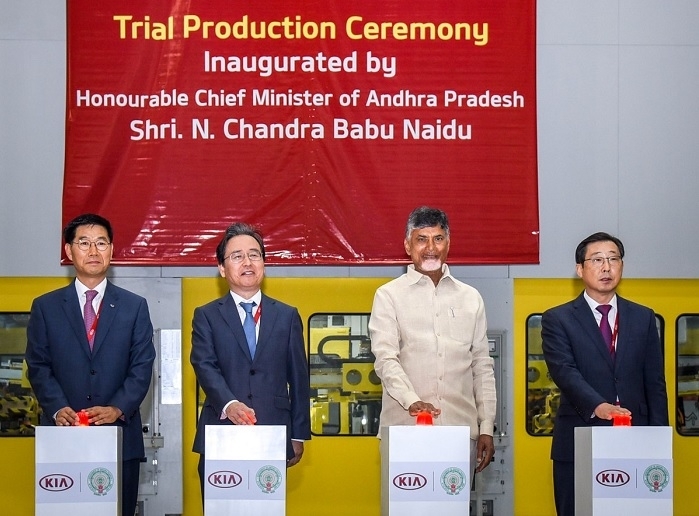 Addressing the programme followed by the trial production launch, Naidu said that Kia Motor’s automobile plant will boost the economic development in the Rayalaseema region. He mentioned KIA Motor’s Trial production plant underlines the relentless efforts conceived by the state government. Referring to the problem of insufficient rainfall in the Rayalaseema region, the Chief Minister claimed that State government has successfully resolved the long-pending water problem and now many automobile firms are willing to set up their establishments. With the whopping budget of Rs 12,9000 Cr, it will provide 11,000 new Job opportunities for locals. The commercial production will begin by Aug 2019. According to state officials, Kia plant will have an initial installed capacity of 3 Lac vehicles per annum and will further expand to 4 Lac vehicles.